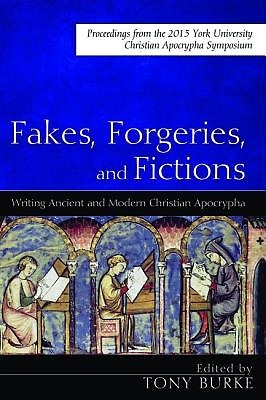 Fakes, Forgeries, and Fictions examines the possible motivations behind the production of apocryphal Christian texts. Did the authors of Christian apocrypha intend to deceive others about the true origins of their writings? Did they do so in a way that is distinctly different from New Testament scriptural writings? What would phrases like ""intended to deceive"" or ""true origins"" even mean in various historical and cultural contexts? The papers in this volume, presented in September 2015 at York University in Toronto, discuss texts from as early as second-century papyrus fragments to modern apocrypha such as tales of Jesus in India in the nineteenth-century Life of Saint Issa. The highlights of the collection include a keynote address by Bart Ehrman (""Apocryphal Forgeries: The Logic of Literary Deceit"") and a panel discussion on the Gospel of Jesus' Wife, reflecting on what reactions to this particular text--primarily on biblioblogs--can tell us about the creation, transmission, and reception of apocryphal Christian literature. The eye-opening papers presented at the panel caution and enlighten readers about the ethics of studying unprovenanced texts, the challenges facing female scholars both in the academy and online, and the shifting dynamics between online and traditional print scholarship. ""Fakes, Forgeries and Fictions is an impressive and provocative collection of essays about the hundreds of apocryphal texts and pseudo-gospels that Christians have written through the centuries. In the process, the essays ask challenging questions about the intentions of these early authors, and just what we mean when we label works as forgeries or fictions. This very informative book offers a rich array of good stories, and fine scholarship."" --Philip Jenkins, Baylor University ""Fakes, Forgeries, and Fictions moves the field forward by leaps and bounds. Through richly illuminating studies of ancient (and not-so-ancient) sources, it illustrates the high stakes of ethical practice in scholarship: how we communicate our work to the public, and how committed we are to equality and access in our scholarly communities, are not peripheral issues, but central to the quality of our intellectual work. A must-read for scholars of antiquity in the twenty-first century."" --Eva Mroczek, University of California, Davis; author of The Literary Imagination in Jewish Antiquity ""Are apocryphal Christian texts fakes and forgeries? Were they intentionally written to deceive Christians? Do they contain facts or fictions? Why were they composed? These are old questions that today's experts on apocryphal literature have taken up anew in this edited volume. The answers are as varied as the stories themselves, from intentional fakes meant to deceive like the fragment known as the Gospel of Jesus' Wife, to honest attempts to capture ongoing religious revelation like the Revelation of the Magi. This volume is a valuable contribution to how we understand authorship of ancient Christian texts, whether we define them as fakes or the real deal."" --April D. DeConick, Rice University; author of The Gnostic New Age: How Gnostic Spirituality Revolutionized Religion from Antiquity to Today Tony Burke is Associate Professor of Early Christianity at York University in Toronto, Ontario. He is the coeditor of New Testament Apocrypha (2016) and author of Secret Scriptures Revealed (2013).